Russian President Vladimir Putin has expressed hope that yesterday's visit to Moscow by US leader Donald Trump's national security adviser will help improve bilateral ties amid tensions between Moscow and the West. Hardliner John Bolton is in Moscow to lay the groundwork for a summit between the Kremlin chief and Mr Trump that may take place next month in Europe. 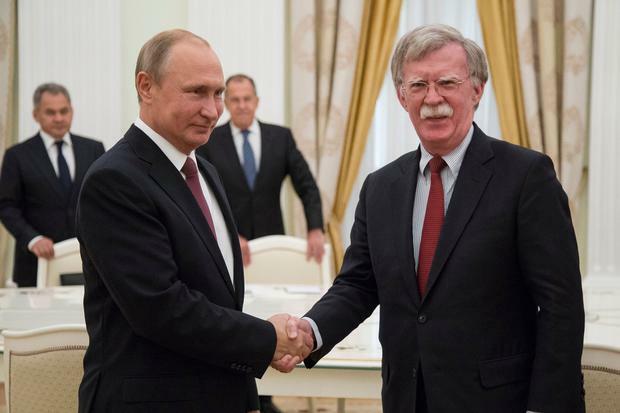 "Your visit to Moscow gives us hope that we can at least take the first step to reviving full-blown ties between our states," Mr Putin told Mr Bolton at the start of the Kremlin meeting after the two smiled and shook hand for the cameras. "We never sought confrontation," Mr Putin said in televised remarks, adding he regretted that the Russia-US ties were not "on top form". Mr Bolton said it was important to keep talking and complimented Mr Putin on his handling of the World Cup, currently taking place in Russia. "Even in earlier days when our countries had differences our leaders and their advisers met and I think that was good for both countries, good for stability in the world and President Trump feels very strongly on that subject," he said. "So again, we are most appreciative of your courtesy and graciousness here and I look forward to learning how you handle the World Cup so successfully, among other things." The US will co-host the 2026 World Cup with Mexico and Canada. Mr Putin's spokesman Dmitry Peskov said earlier in the day the meeting would be used to discuss "the sad state" of bilateral relations as well as top international issues. Mr Trump said this month that Russia should be re-admitted to the G7 group of industrialised democracies, from which it was suspended for its annexation of Crimea in 2014. A former US ambassador to the UN, Mr Bolton is known for his hawkish stances and has repeatedly called for tough sanctions against Russia. "We negotiate with Russia at our peril," he wrote in a column for the 'Daily Telegraph' in 2017. Earlier yesterday, Mr Bolton met behind closed doors with Foreign Minister Sergei Lavrov and the first deputy head of Russia's security council, Yury Averyanov. There has been speculation that a meeting between Mr Trump and Mr Putin could coincide with the World Cup final. Benjamin Netanyahu is also considering coming to the game, and Mahmoud Abbas has already accepted an invitation from Mr Putin to attend, raising the possibility of an Israeli-Palestinian summit around the match. Any summit is expected to happen when Mr Trump travels to Europe in July. He will attend a Nato summit in Brussels on July 11-12, where discussions may be strained by his decision to impose tariffs on Canada, Mexico and the EU, all major trade and security partners of the US. Then on July 13 he will begin his long-delayed visit to the UK and stay until at least the next day, holding talks with Theresa May and meeting the queen at Windsor Castle.